At different points in a child's development, they all ask questions about the beginnings of human life. And as parents, we fumble through answering them at the level of detail we think is appropriate for their age and level of development. Then moments later, after the subject has passed, we kick ourselves for not saying something else. Will the Nine Month Miracle eliminate this common challenge? No. We still need to make that individual assessment each time, about what they are really asking, and what they need to know. But the Nine Month Miracle will be appropriate in many situations, and having it available as either a personal reference for the parents, or as a family resource at the apropriate time, is a great idea. A word of warning to parents: We would not recommend allowing your children to use this software by themselves the first few times, because it could produce many questions and raise a few concerns. 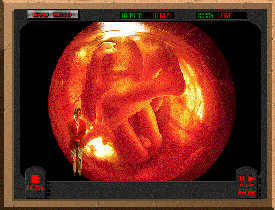 The software begins with a diagram showing the initial physical steps leading to conception, and includes a few segments of video images of childbirth. While presented from an academic perspective, we would caution you to run through it yourself before considering allowing your child to view it alone. The software includes a special section for younger children, entitled, "A child's view of pregnancy," which might be preferable for younger children. Installation is typical for a CD-ROM on both the PC and Mac. Use is intuitive, but reference to the manual might prove helpful if you are trying to select only certain portions to review with your child. All of our parent reviewers felt this was an excellent program to have available to review with their children at the apropriate time.